Project Management and PMP(Project Management Professional) certification were pretty hot topics couple years ago, recently it seems a bit out-of-fashion as the Agile Project Management style getting popular. Many people would think PMP is evil and no longer useful because it focus on process and tools, and the ash bin is where it belongs to. I do not totally agree with it because, Agile Manifesto said we value Individuals and Interactions over process and tools. It did not say Individuals and Interactions ONLY, TO HELL WITH process and tools right? My view is PMP could be a good complement to Agile and Scrum, where Agile focus on mindset and frameworks and PMP shows us what tools and process could be useful. Although Agile promoting “developing product instead of projects”, in reality there are situations using projects are more applicable. As Project Manager role disappeared, project management activities and responsibilities are now transferred to Team Members’ shoulder. It is importance that everyone understand what project management is and how to apply it, plus PMP course fees are cheaper now. By PMP definition: A project is a temporary endeavor undertaken to create a unique product, service or result. There are two keywords here, temporary and unique. Temporary means there is a defined starting and ending time, where unique means the output (product, service or result) can not be similar to what we already have. So if what we are doing is not temporary and not producing unique output, we will call this “Operations” instead of “Project”. For example, which of the followings are projects? 1 is not a project, it is more like a wish. It does not have a starting and ending time. 2 could be a project, it has a starting (now) and ending (end of year), however we can’t tell if this is unique. 4 is not a project, it has starting and ending date, however the activities are similar to last year, there might be some variances (different weather, different people) but in general it is not unique enough. In reality, it is unlikely things will be the same every time, so as long as difference not not very significant, we will categorize the activity as Operations instead of Project. The fundamental unit of project management is “process”, each process have Inputs, Tools & Technique, and Outputs. Inputs are like foods, Tools & Technique are like hens, Output are like eggs (or poo?). Even we all have some inputs, but how we understand and use tools & technique can produce very different outputs. This is a typical process in PMBOK. Don’t be frightened by how complex it looked, usually we will only need a small portion to deal with matters in real life. And we can always look those up from Project Management Bible PMBOK (Project Management Body of Knowledge). To make it seem easier to understand, PMBOK grouped processes in two ways, first way is by sequence of time as project progress (called Process Groups), eg. Initiating, Planning, and Closing. Another way is by related knowledge (called Knowledge Areas), eg. Time Management, Communication Management, and Cost Management. In other words, each process can be looked up from 5 Process Groups (Time Sequence) or 9 Knowledge Areas (Related Knowledge). 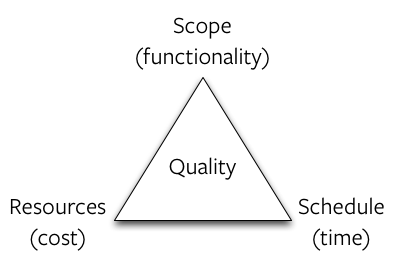 When talking about projects, first thing we shall define Cost, Scope, Schedule and Quality. Find out who will impact project. Even when we have same members to perform same activities, there will be different result in different organization, that’s where organizational influence come in. PMP exam is not too difficult to pass, in fact the people whom had done mock exams is able to pass. Project management required real life experience and judgement, PMP certification could not prove those. PMBOK also mentioned that each project is different and unique, and each process has to be tailor made based on projects situation and needs. So we shall use our knowledge, experience and judgement to decide which process to use and how to use will be best for our projects. With this Series, you will find project management is fun, simple and easy to apply on daily life, just like instant foods, unpack and enjoy! This entry was posted in Titansoft Culture and tagged pmp, project management on August 10, 2015 by 敏捷黑手阿伊 Yves Lin.